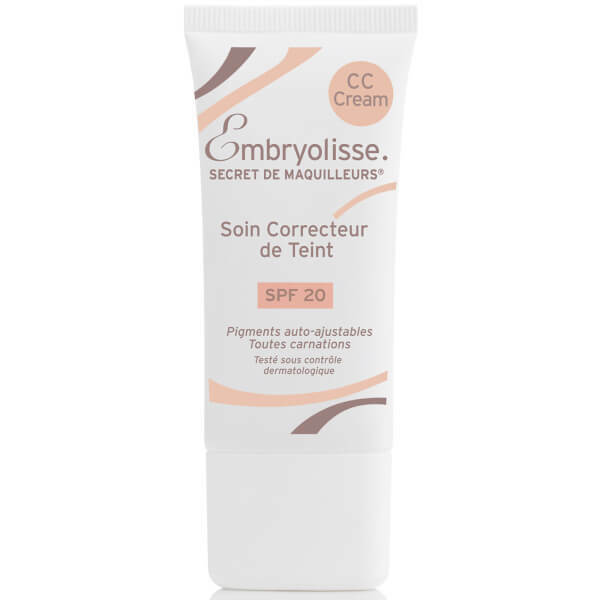 Achieve a flawless base whilst shielding skin from harmful rays with the Complexion Corrective Skincare CC Cream SPF20 from French pharmacy skincare label, Embryolisse; a universal skin perfector that adapts to skin tone, replumping skin and preserving its youthfulness. Blurring the appearance of wrinkles, fine lines and dilated pores through the use of soft-focus particles, the cream coats the face in a high-coverage ‘second skin’ veil. Enriched with ultra-hydrating Hyaluronic Acid, the treatment moisturises and smooths skin whilst protecting skin from UV photo-ageing. Delivering a comfortable, lightweight texture with a silky feel and velvety finish, skin is left feeling soft, smooth and radiant. Aqua (Water), Isodecyl Neopentanoate, Ci 77891 (Titanium Dioxide), Pentaerythrityl Tetrabehenate, Polymethyl Methacrylate, Bis-Ethylhexylphenol Methoxyphenyl Triazine, Peg-30 Dipolyhydroxystearate, Pentaerythrityl Tetrastearate, Glycerin, Corn Starch Modified, Ci 77492 (Iron Oxide), Nylon-12 Fluorescent Brigthner 230 Salt, Polyglyceryl-4 Isostearate, Synthetic Fluorphlogopite, Ci 77491 (Iron Oxide), Phenoxyethanol, Parfum (Fragrance), Ci 77499 (Iron Oxide), Sodium Chloride, Potassium Sorbate, Polyvinylalcohol Crosspolymer, Sodium Hyaluronate, Biosaccharide Gum-1.